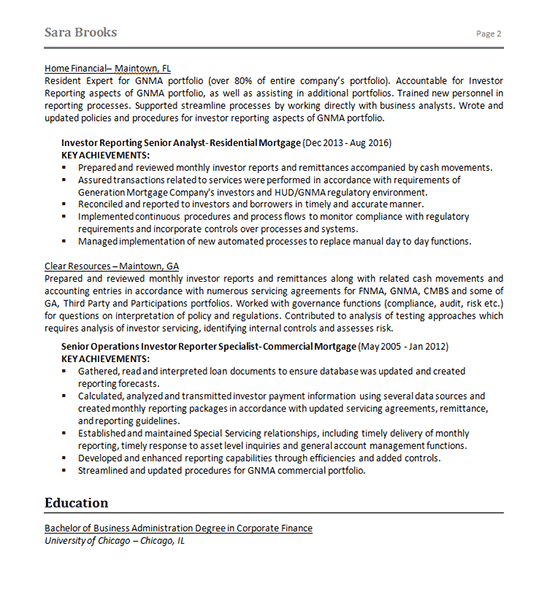 The summary of the resume showcases Sara’s investing reporting management, accounting, and implementation skills. The “Highlights of Expertise” section contains keywords appropriate to her experience for ranking high in applicant tracking systems. Immediately following, is a recount of her professional experience investing in reverse chronological order. The initial statement below her company name describes her duties and responsibilities. Financial accomplishments, successful results and highlights of important events are stated in bullet points. Page two continues to build on prior positions as a senior investor reporting analyst and operations specialist. The document closes with a listing of the Bachelor of Business Administration degree in Corporate Finance. and closing with Sara’s education. Tenacious and dynamic professional offering comprehensive and progressive years of experience in all facets of investor reporting management and accounting. 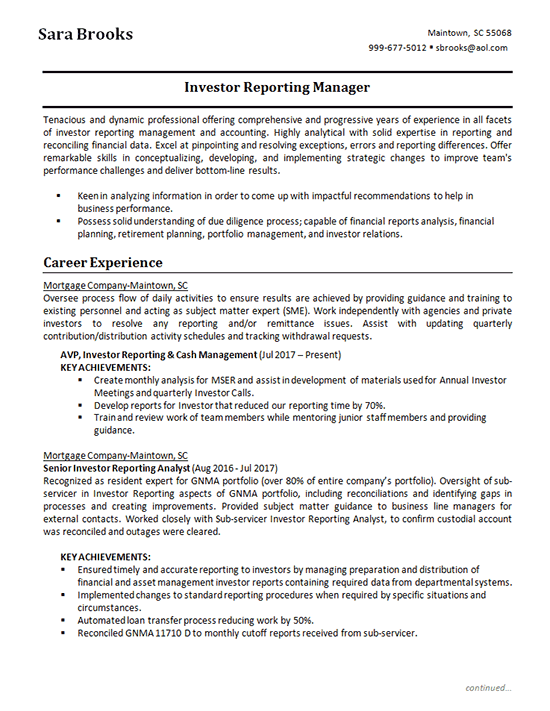 Highly analytical with solid expertise in reporting and reconciling financial data. Excel at pinpointing and resolving exceptions, errors and reporting differences. Keen in analyzing information in order to come up with impactful recommendations to help in business performance. Possess solid understanding of due diligence process; capable of financial reports analysis, financial planning, retirement planning, portfolio management, and investor relations. Oversee process flow of daily activities to ensure results are achieved by providing guidance and training to existing personnel and acting as subject matter expert (SME). Work independently with agencies and private investors to resolve any reporting and/or remittance issues. Assist with updating quarterly contribution/distribution activity schedules and tracking withdrawal requests. Recognized as resident expert for GNMA portfolio (over 80% of entire company’s portfolio). Oversight of sub-servicer in Investor Reporting aspects of GNMA portfolio, including reconciliations and identifying gaps in processes and creating improvements. Provided subject matter guidance to business line managers for external contacts. Worked closely with Sub-servicer Investor Reporting Analyst, to confirm custodial account was reconciled and outages were cleared.